After changing it back to the default (UseExchangeDSNs) the cmdlet started working. 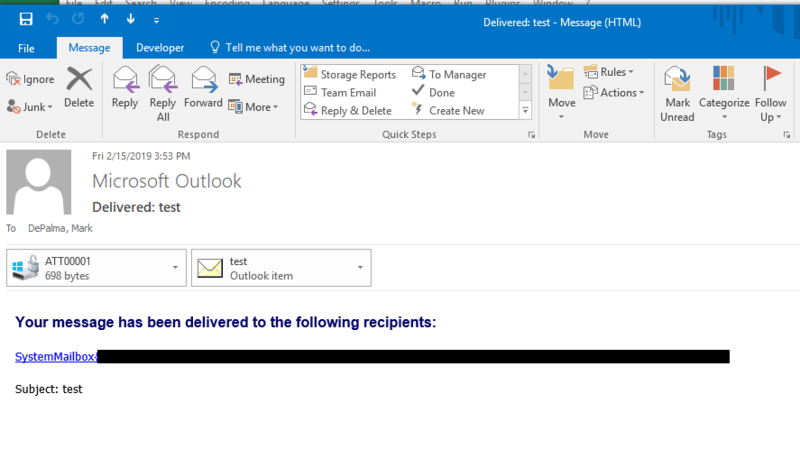 During testing I was sending email from my mailbox to a system mailbox with the ‘Request a Delivery Receipt‘ option checked. Exchange is expecting the default format in the delivery receipt DSN email and when it is modified Exchange cannot process it. This entry was posted in Exchange, PowerShell and tagged exchange on February 18, 2019 by Mark DePalma. For years Citrix has created the Receiver installer with per-user installation functionality where if the installer is launched in the context of a regular user it will install/register the components to the local user’s profile rather than just failing with a permission error. This creates a huge headache when trying to mass deploy Receiver (now Citrix Workspace) to the environment. You wind up with machines that have both installed. When this happens the user that had the per-user installation cannot launch applications. Even worse the machine/profile usually winds up being in a state where the per-user installation cannot be removed. Even if you get it removed the uninstaller and Citrix’s own cleanup utilities do an awful job at cleaning up the registered classes/components in the per-user installation. Their tools only clean up a fraction of what is actually there. My last two work environments (and current) have been plagued with these installations. I spent time a while back figuring out how to clean it up manually, but it is a major headache to do so. I tried logging a case (and an enhancement request) with Citrix about two years ago stating their ‘Receiver Clean-up Utility‘ utility does not properly clean up these installations. They later came back saying they no longer are supporting the utility. It seems that since then they’ve updated the utility to clean installs up to version 4.3. I decided to build a wrapper script around the Citrix Receiver Clean-up Utility to fill in the gaps. To do so I had to create a full list of everything I had to target. I decided to extract the MSIs from the installer I was testing with and dissect them. I used SuperOrca to pull the ‘Registry’ table from each MSI. 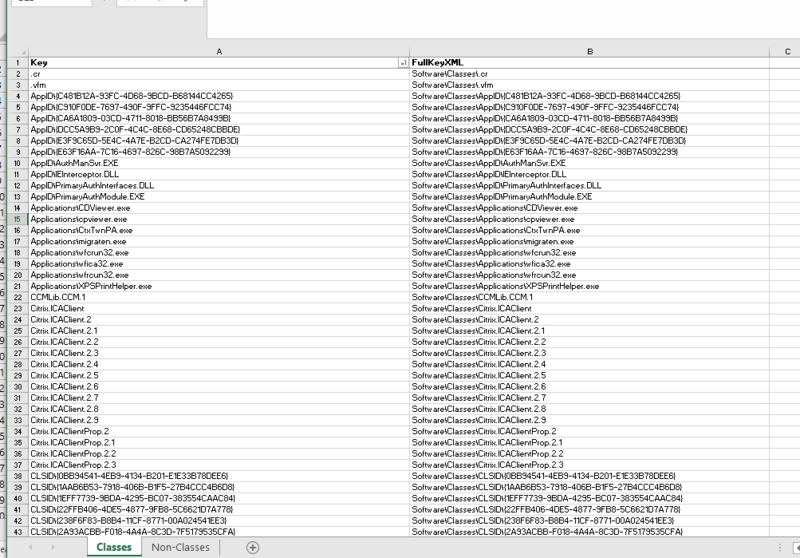 I imported those into Excel and used filtering/VLOOKUPs to extract what I needed. I have tested the script with multiple versions and so far it is working well. It does require that you download the ‘Receiver Clean-up Utility‘ and place the executable in the same directory as the script. Feel free to submit any issues here or in the GitHub repository. 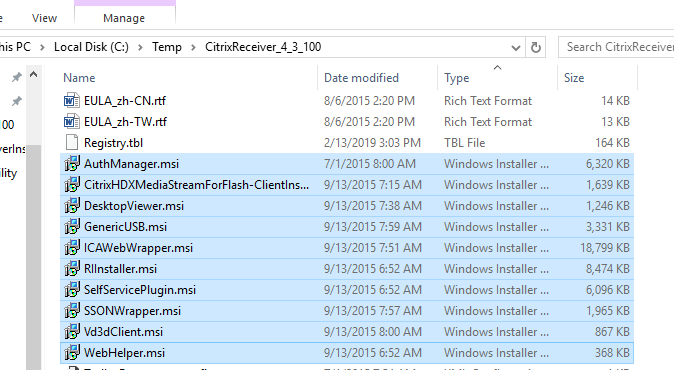 This entry was posted in Citrix, PowerShell, Scripting and tagged citrix, powershell, receiver on February 15, 2019 by Mark DePalma. I was using an XML body to pass one parameter as per the documentation and the user id was correct. I was unable to find any information on this error and the only thing I was left with was using a JSON body instead of XML for the POST. Once I switched to a JSON body the call was successful. I tested other POST commands using an XML body and they did not produce this error. This entry was posted in Scripting and tagged airwatch, api, json, rest, xml on February 6, 2019 by Mark DePalma.